Happy New Year! I read quite a few New Year resolutions and goals these last few days and I feel like I should have mine figured out but I don’t. I am the same me and yet the beginning of the year always feels uneasy as I reflect on what brings me joy and the things I need to intentionally do less of. For example, last year I would get overwhelmed (and stay up late) by hoarding try-ons for a longer post but hopefully this year I can share more timely reviews. I want to stop overthinking when and what to post since those kinds of thoughts are just me getting in my own way. I shared a number of things on my Daily Updates page that could have been short blog posts. With that in mind, I wanted to share a few items I received in the mail and a few recent try-ons. 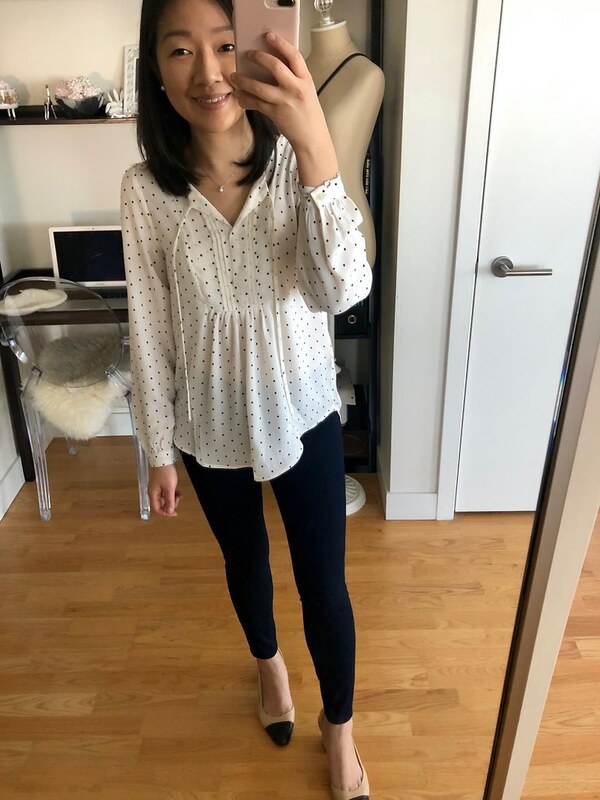 The above dotted blouse runs one size bigger and size XXSP fits like my usual size XSP. The v-neck is very low cut so I used fashion tape to make the neckline more modest but a layering camisole is a must with this blouse. I had high hopes for this sweater dress but size XXS regular is too loose fitting on me to be flattering. I’m sad that it doesn’t come in petites since the striped cuffs on the sleeves are a really cute detail. 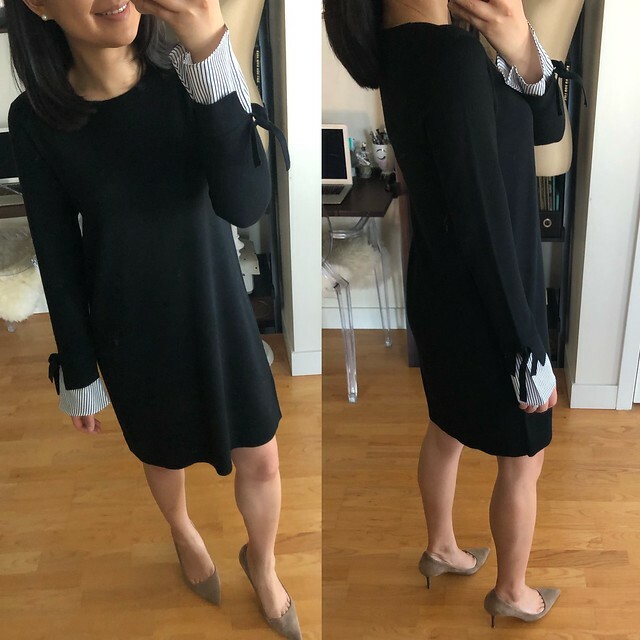 Update 1/10: Thanks to Maggie for the heads up that this dress now comes in petites! I also ordered this striped tie neck dress in size XSP but I returned it before I could take photos to share. I didn’t love how it looked on me although it fit true to size. This chambray tie hem top is another item I ordered but returned before I could take photos but it fit true to size. Size XXS regular was a bit snug at the hips since the material has no give but I suppose I could have loosed the tie hem knotted detail. 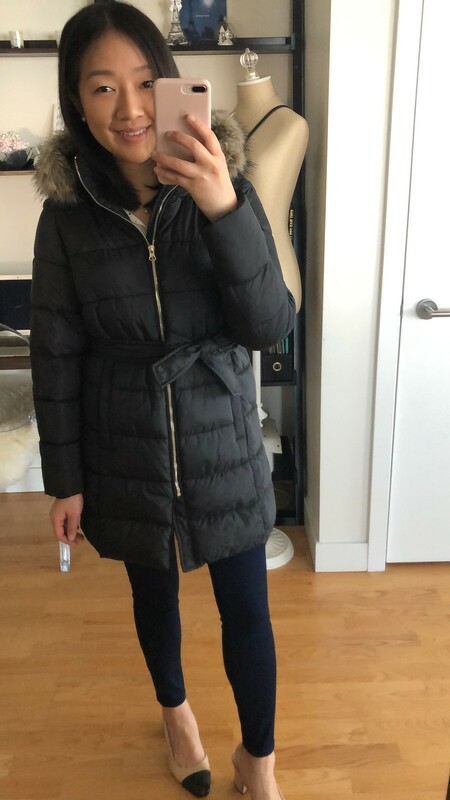 I previously reviewed the olive color of this puffer jacket in size XXS regular this post. I came across size XSP in store this past weekend and I used my $80 in LOFT Rewards to buy the jacket (it didn’t hurt that it was also 50% off). Otherwise I normally would have waited for a better sales promotion but I noticed that the black color was sold out online in petites at the time. The proportions of my usual size XSP fit me better than XXS regular. I’m self conscious about my waist (or rather lack thereof) so I vacillate between being okay with wearing it belted versus unbelted as shown further below. This puffer jacket fits true to size for a relaxed fit that is comfortable for layering. If you prefer a more fitted look then you may be able to try the size down but I opted for my usual size XSP. 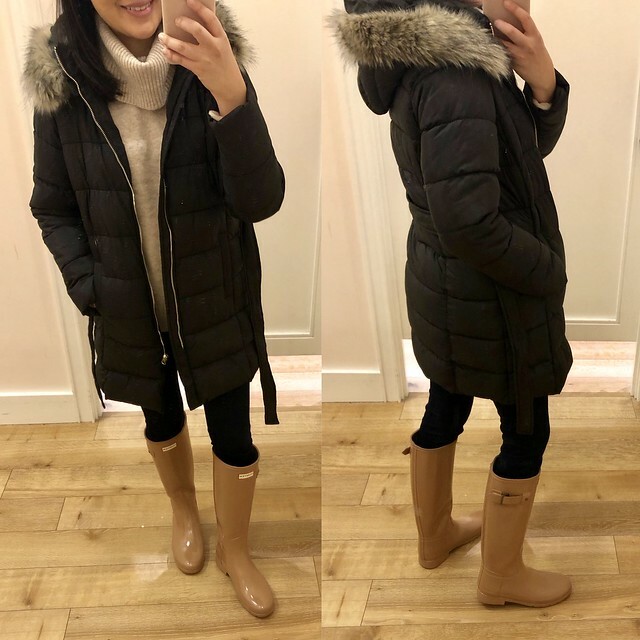 I also have the puffer jacket in white in the same size (review here) but the shorter version fits slightly roomier so I wish I had sized down to size XXSP especially after my friend Su shared how it fit her since we’re similar in size at LOFT. FYI. 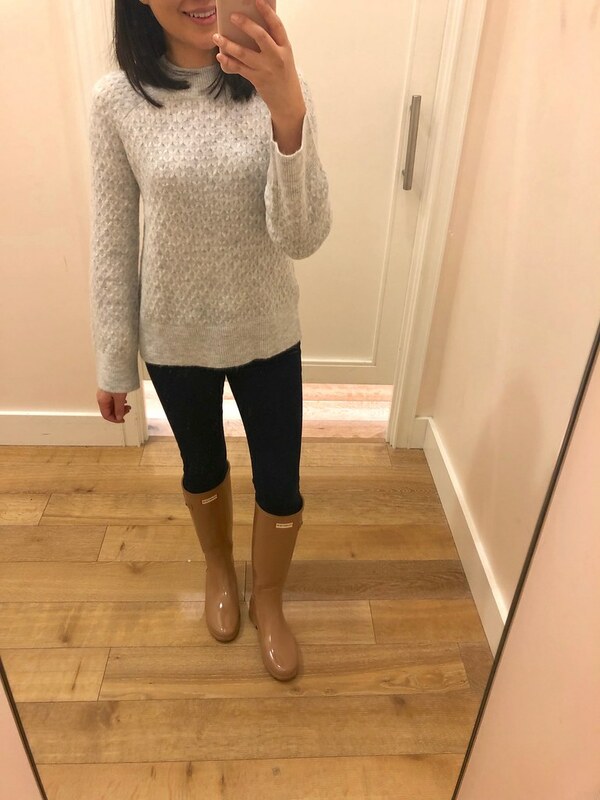 The tawny color of these refined Hunter rain boots are now $99 (review here) and I’ve received a lot of compliments on them due to the different color. I’m tempted to get them in the matte black color too. I also bought this sweater in my usual size XSP for a relaxed fit. It doesn’t contain any wool so it’s not itchy. It’s a thinner sweater which makes it comfortable to wear since it’s not bulky. If you like a pop of color it’s also available in pink. If you don’t like cowl necks then check out the flare cuff sweater instead. I like the look of this mock neck sweater with the color block stripes. My usual size XSP has snug sleeves while the body is a relaxed fit. Note that it contains 26% wool. Here is the short white puffer jacket on me. I was able to machine wash it (note I removed the hood so I wouldn’t ruin the faux fur lining which isn’t detachable) and I line dried it. As you can see from the below side view my usual size XSP is roomy on me so I should have sized down to size XXSP as mentioned further above. I may list this jacket on my Poshmark since I will probably favor wearing the black color which is longer. I meant to list some items on Poshmark but my husband’s family stayed with us this past week for the holidays so I used thredUp instead so that I could quickly free up some space. My last Clean Out bag I sent in October was so low that it deterred me from ever wanting to use their services ever again. 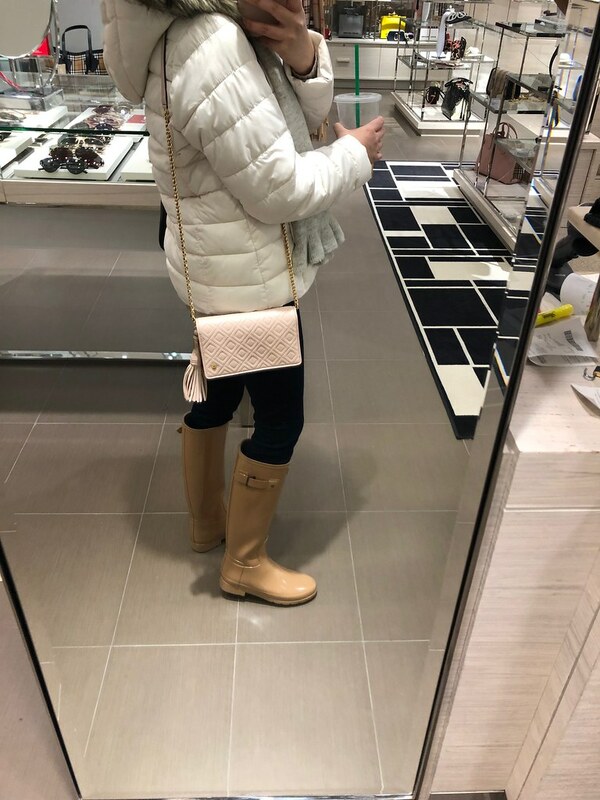 I spotted one of these pretty pink crossbody bags on sale at Neiman Marcus for $174 when it normally retails for $348. There wasn’t anything wrong with it but my husband was right saying that it wouldn’t fit much. I also gave my navy quilted crossbody bag to our little 4 year old niece since I can’t seem to say no to her so I am looking for a replacement. I prefer it in black anyway so hopefully the color I want will be restocked at some point. If you miss the current mystery sale LOFT may have another 50% off promotion in the middle and end of this month. Last year they had a flash sale mid-January that included free shipping. 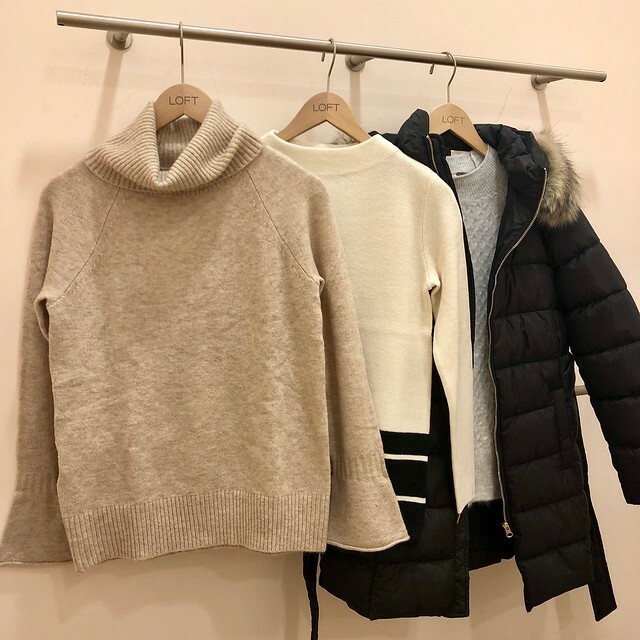 Ann Taylor may offer an extra 70% off sale styles mid-month if they stick to the same sales schedule as last year. As always, please refer to my Sale Alerts page for the latest sales and coupon codes. That sweater dress! I saw it online tonight and loved it for work – I’m tempted to order it. What didn’t you like about it? Thanks! Thanks Lynn! I like the style but it was too loose on me and it doesn't come in petites. 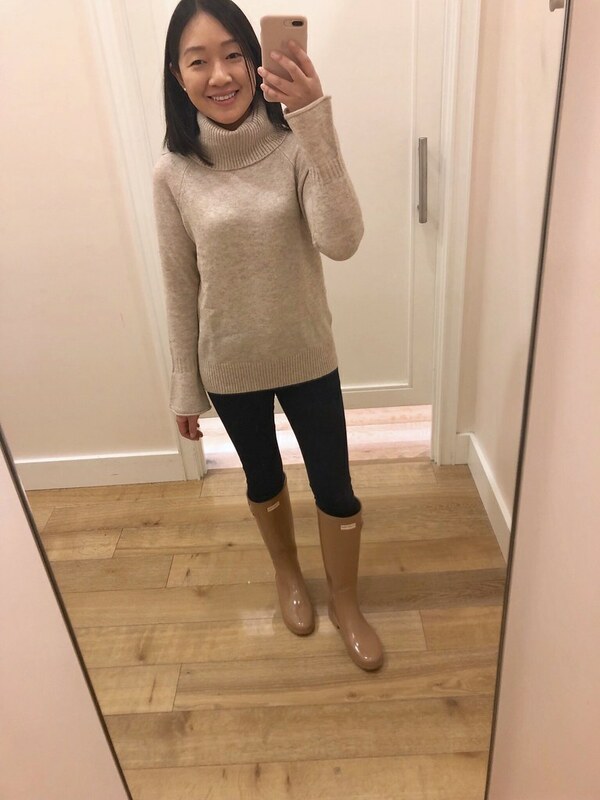 🙁 There's a link to a short video clip where you can better see how it fits directly below the photo for the sweater dress. Thank you Jess! Love your posts and try-ons! A little off topic, but I was wondering if you ever washed your gray Ribbed V-Neck Tunic sweater that had a problem with pilling in the reviews. I haven't worn mine yet and wonder if I should keep it or not. Hi Tammie, I have worn and washed mine a few times (I wash on cold and line dry) and for me the sleeves do pill. I whip out my sweater shaver to take care of the pilling and it's not a problem but if it's too much trouble then I would recommend returning that sweater. They have so many other cute sweaters to choose from. You're welcome, Tammie! I think if I was wearing it alone (without a jacket) and with a bag then it may rub and pill on the side where I carry the bag. For work and in general I use my hands for typing so my pilling seems to only be concentrated on the lower sleeves (from elbows down). The Walmart mock neck sweater I got pills more at the sleeves and I need to try to use the sweater shaver on that one. It's cute and not itchy. I'm sure it will be available next month too. Sizes always pop back if others change their mind so nothing is sold out if you're persistent. I always bookmark items I missed out on since I prefer to buy at a good sale price.